The world’s most delicious run is back! 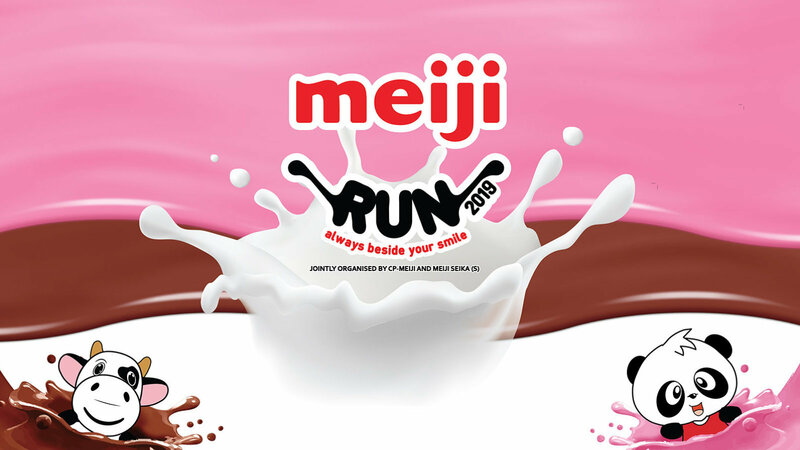 Join in the fun with your family and friends by treating yourself to delicious snacks and drinks after the run at the Meiji Buffet! Capture exciting moments at the GIF photo-booth and top it off at Sentosa’s fun-filled movie screening. 1. 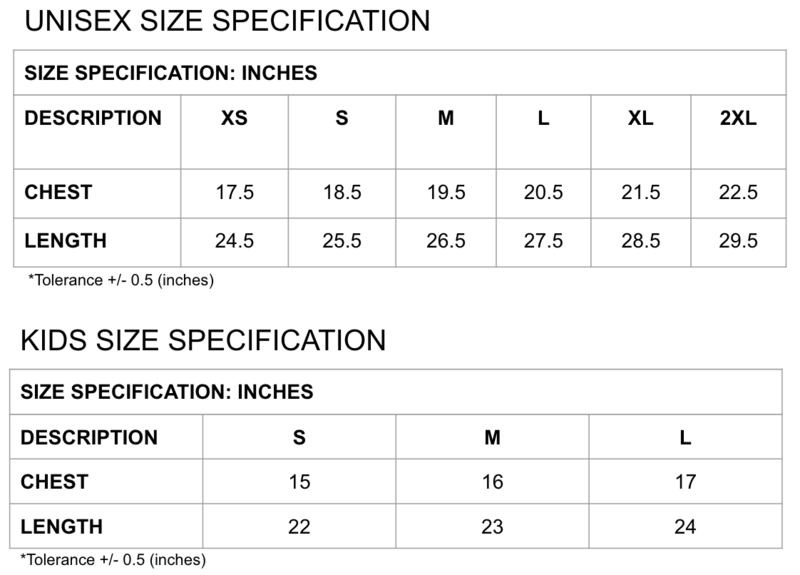 Is it Compulsory to wear event t-shirt to the run ? Ans: No, it is not compulsory for all participants to wear the event t-shirt to the run. 2. 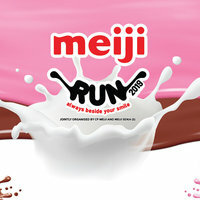 What is the minimum age requirement for Meiji Run 2019? 3. Am I required to pay the Sentosa admission fee? 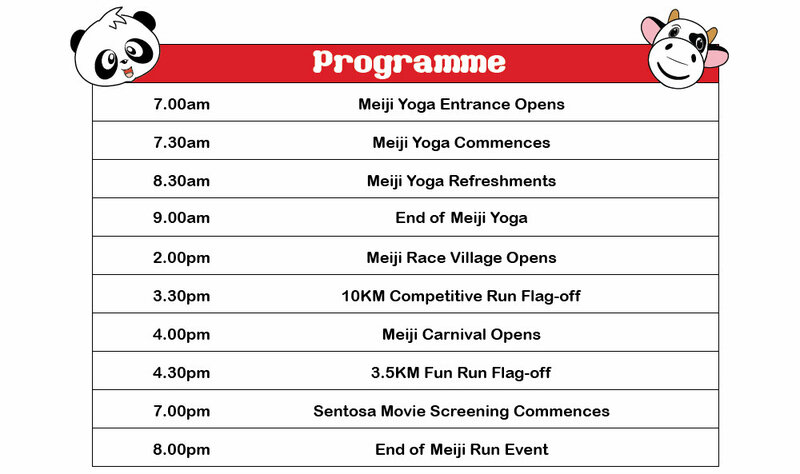 Ans: No, you would not be required to pay the admission fee (Driving/ shuttle bus/ Monorail) as long as you flash the Meiji Run Bib to our friendly staff. 4. What do I need to bring on the Race Day? 5. What time should I arrive on the event day? Ans: It will be advisable to arrive at least an hour before the indication of the wave. 6. I'm driving to the event, where should I park? 7. Is there a cut-off time for the race? 8. Am I allowed to bring pets/strollers in the race? Ans: Pets and strollers are strictly not allowed into the race. 9. Will there be a bag deposit area? Ans: Yes, there will be a complimentary bag deposit area. Kindly head 30-60mins in advance before your race starting time to ensure a smooth process. 10. What if I get hurt during the race? Ans: Should you injure yourself in the midst of the race, do notify our friendly race marshals and immediate actions will be taken to ensure you get the appropriate medical attention. Ans: Our friendly route marshals will divert runners to nearby sheltered areas on the route. In view of safety and well-being of runners, the organizer may decide to call of the race due to bad weather. 12. What is the minimum age requirement for Meji Yoga 2019? 13. Do I get a refund if I choose not to participate after the registration? Ans: No refunds will be provided as per terms and conditions. 14. Can my friend run in my place if I am unable to make it? Ans: No, transferring of race slots is strictly not allowed.